Demographic quality of the traffic is being measured by the “GNB module”, based on the country groups and their weights. You can decide a certain trade is sending you to much “bad” traffic in return for your “good” traffic. Don't decide a trade is a potential cheater too fast - if you only receive e.g. 10 Raw hits a day, they might be from “bad” countries one day and from “good” ones the next. Navigate to the Overview menu. There you can find GNB graph for each individual trade, system trade and totals. This graph is based strictly on the amount of incoming raws received from each country group. You can also enable Quality column (use Interface manager). Quality ratio is calculated based on the amount of incoming raws received from each country group and their weights. 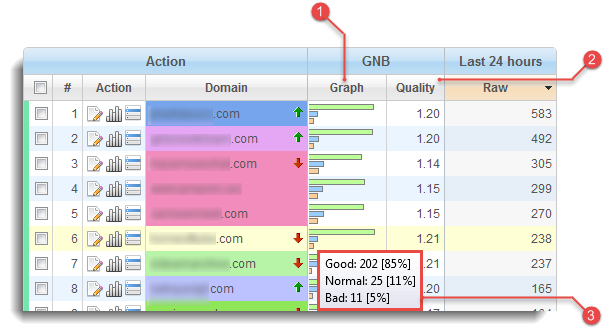 By default, GNB quality ratio is NOT included in the algorithms for outgoing traffic distribution and it serves for informative purposes only. To inspect detailed GNB information for an individual trade, place your mouse pointer over its Graph table cell. We don't recommend enabling this option, unless you have very specific requirements. If you are considering it, read this chapter carefully and make sure you understand it. GNB quality ratio is calculated based on the amount of incoming raws received from each country group and their weights. Navigate to the Overview menu and use Interface manager to enable GNB quality ratio column. Higher ratio represents better demographic quality of the traffic. By default, GNB quality ratio is NOT included in the algorithms for outgoing traffic distribution (strongly recommended) and it serves for informative purposes only. If the Include option is checked (not recommended), more traffic will be sent to trades with higher “GNB quality ratios” (demographic quality) and less traffic to your “valuable” (quantity) trades. Traffic on your site will decrease, but the demographic quality will increase. The problem is, you just can't have BOTH. There are three different preset country groups: Good, Normal and Bad. If you believe that some countries should be in different groups, you can simply drag them from one group to another (use CTRL for multiple selection). To proceed click button. Network sync function allows you to copy all settings from the “Good, normal, bad” pop-up to the other sites in your network. To proceed, select sites from the multiple select box and click button.